Silverlock Estate residents in Southwark got behind the new Sky Atlantic drama Save Me, opening their flats as locations and making the public spaces available for filming as well. A fictional Deptford housing estate called The Towers sits at the heart of the drama, connecting its key characters and giving the show its vibrant authenticity. The key role the estate plays is clear from the start, in the trailer. The series producer Patrick Schweitzer has said shooting in real locations as opposed to studios was worth it for the end result: “Nick [Murphy, director] and I had wanted the spaces to bully us a little rather than us having it all our own way,” he told Broadcastnow.co.uk. FilmFixer manages the film office service for the neighbourhoods where the series is set, mainly Lewisham and Southwark, along with Lambeth, Islington and Camden. FilmFixer director Andrew Pavord says, “Southwark residents stepped up to make their homes available, playing parts of Lewisham where needed. Lots of the most dramatic scenes though, were filmed in Lewisham itself, particularly along Deptford High Street. “We’re also impressed by the drone shots taken around the Silverlock Estate. Permitting drone filming is an emerging requirement needing liaison and approval from a range of parties, including the Civil Aviation Authority, and residents, out of respect for their privacy. For this production we all got it right in my book, and the stunning shots across Lewisham and Southwark were really worth the effort. “The Silverlock Estate acted as the home of Nelly Rowe, played by Lennie James, and his friends, who band together to search for missing teenager Jody, Nelly’s estranged daughter. We had access to a vacant flat on the Silverlock, which made the world of difference, and other residents’ homes became the flats of characters Bernie and Melon and Tam. “Although Jody’s mother Claire now leads a more glamorous life, she started out on the estate and that’s where she met Nelly. “In the first episode Nelly’s taken away from the Silverlock Estate by police for questioning. When he’s released Nelly takes up the search for his girl. “There’s a scene in Roberts Close in Southwark, where Detective O’Halloran is studying the burnt-out husk of a silver Ford Focus in an off road carpark. 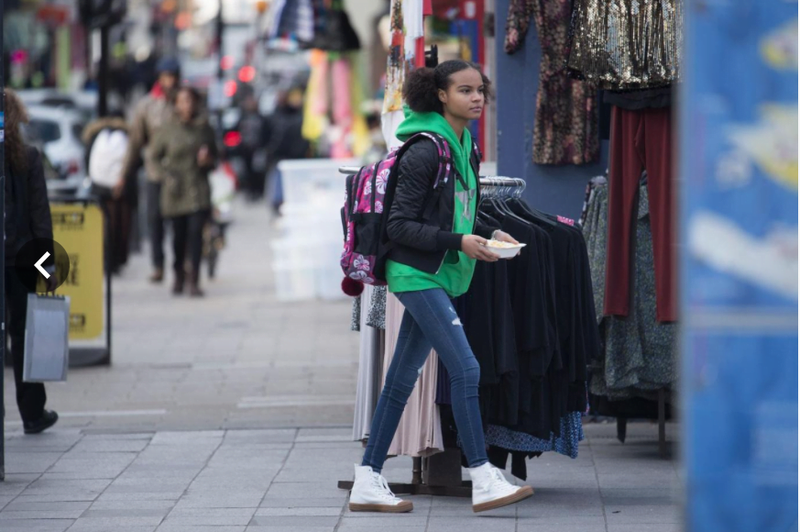 “Missing Jody has been filmed walking along Deptford High Street eating chips. So this is where her disappearance is re-enacted, with Jody’s mother Claire desperately hoping for clues. Bernie is on Deptford High Street handing our “Missing” leaflets there as well, to support the effort. “Jody has walked into the distinctive Deptford Lounge building and sat in the cafe playing on her phone. But she left and crossed the road to get into a silver Ford Focus. “The extensive filming around Deptford High Street included the Frankham Street Carpak which, among other scenes, sees a stolen kiss. “In Lewisham, Lennie pretends to sell beauty products door to door in a bid to get information about Jody. This was shot along and near Arbuthnot Road. “A scene was shot on the footpath of Goding Street in Lambeth. “The show is a tale of two Londons though. Claire is married to music promoter Barry who adopted Jody as a baby. The production crossed the river to film Barry’s workplace in Camden, at the O2 Forum in Kentish Town.